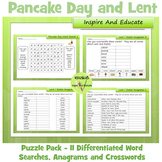 Also included in: History Cryptogram Puzzles GROWING BUNDLE! 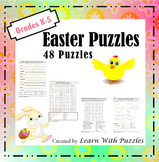 Your students will enjoy these adorable springtime puzzles. Skip count by 5s or 10s (depending on the puzzle) to put each puzzle together. 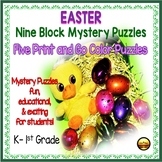 There are 8 puzzles in all. 4 puzzles skip count by 5s and 4 puzzles skip count by 10s. 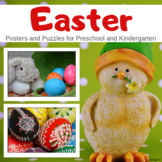 This is a fun book of puzzles and coloring. 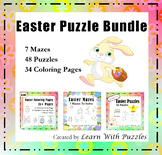 There is one Word Find, three Mazes, a Crossword Puzzle, a Hidden Phrase Puzzle, two Math Block Puzzles, and six coloring pages. 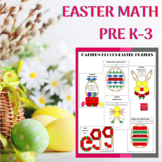 Easy to set out & easy to use:) Mrs. R.
Treat your studetns to some fun and games as they practice their spelling, learn new vocabulary, and develop their critical thinking skills with these 3 activities. Appropriate for ESL and Language Arts. Answers included. 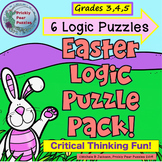 This set has 22 two-piece puzzles +answer keys to practice Easter vocabulary in a super fun way. 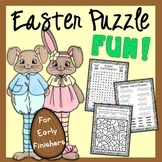 Black and white puzzles included. 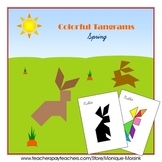 Instructions: Students cut the cards and make the puzzle pieces . 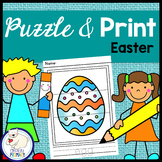 Pair work: Each pair gets one set of Easter Puzzles. They have to match pictures and words.